Future wars will be won by innovative thinkers able to see opportunities in an intensely competitive world, says Army Chief Angus Campbell. 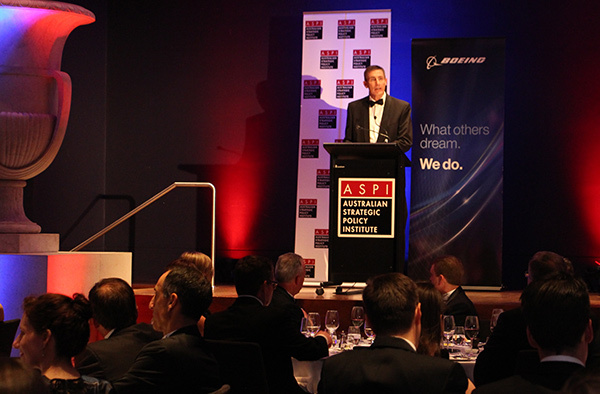 In his address to the ASPI–Boeing National Security Dinner last night, Lieutenant General Campbell said that the people who would win the important fights of the 21st century weren’t those who’d mastered the processes and concepts of last century, or even of today. ‘They are the people who will be able to look into the intense competition already occurring in our world, and in future wars, and see things in them we cannot see,’ Campbell said. The Army chief noted that by mid-2015 the force was entering an unprecedented 16th year of operational activity—globally, regionally and at home. Since the 1990s, a lot of work had gone into mapping out how the Army would be modernised and networked to make it a much more effective fighting force, Campbell said. ‘But big ideas are only as valuable as the effort made to deliver them; delivered through hard work over long years of consistent effort. ‘As I recently said at ASPI’s Joint Integration Conference, we haven’t always been as focused on delivery as we need to be. And much of this design agenda remains unfinished. To give you a sense of this, (former Army commander) Peter Leahy started the thinking about the “Hardened and Networked Army” 15 years ago, yet we are still not a networked Army today,’ Campbell said. ‘We have spent the last two years very deliberately trying to progress the delivery of that Army design. With plenty of newly minted Defence policy and an incomplete Army design, it has been a season to consolidate and deliver. Jack Welch, the iconic CEO of General Electric, captures my thinking, when he said that in real life, strategy is actually very straightforward. You pick a general direction and implement like hell! Support to operations: this is why our Army exists. Assist our wounded, injured and ill: to rebuild capability and respect our people’s sacrifice. Modernise the force: to give our people the best opportunity to achieve their missions and come home safely. Ongoing cultural reform and renewal: to ensure our Army reflects the highest expectations of the Nation we serve. Modernisation included a 15-year effort to move the Army from an analogue to a digital-by-design force, Campbell said. ‘This is grindingly hard work at the core of generating and sustaining a joint land effect on the modern battlefield. Army had highlighted family and domestic violence, Campbell said. ‘The ill-disciplined use of violence domestically is criminal, while the ill-disciplined use of violence on operations is a war crime. One begets the other: neither is tolerable. The appropriate, legal, ethical and disciplined use of violence is a core skill for soldiers. Domestic violence is the antithesis of this. ‘Addressing Domestic Violence is specifically about the effectiveness of our capability, and it’s the right thing to do,’ the Army chief said. Brendan Nicholson is defence editor of The Strategist.